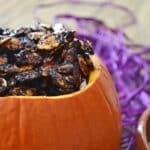 Nothing says Halloween like roasted pumpkin seeds. 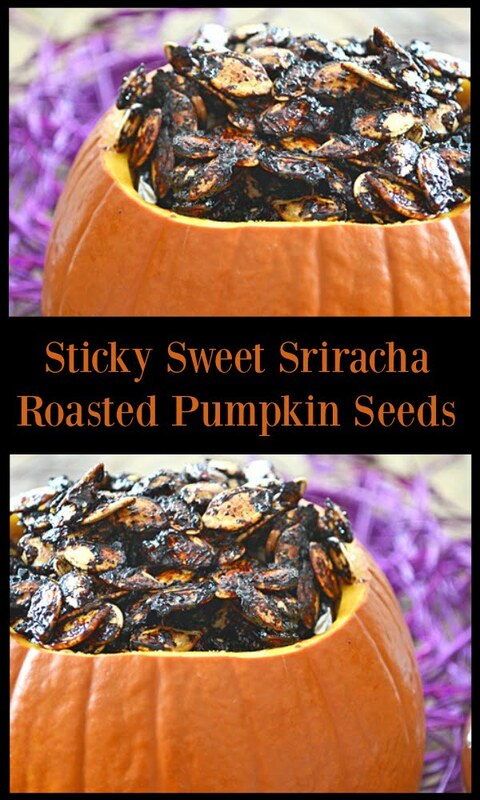 What if they could shout Halloween by being blackened, sweet, sticky and spicy? 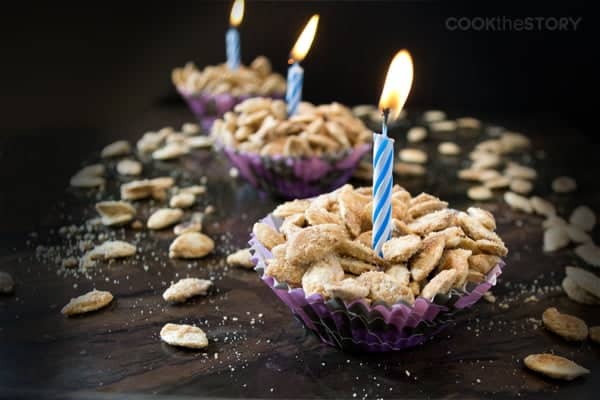 Get the recipe here! These guys are totally different from the usual pumpkin seed but so much more addictive. They’re spicy from a blast of sriracha, salty from a dousing in soy sauce and sticky sweet from a drip of honey. I ate a whole batch of them in one sitting! I’ve decided to buy yet another pumpkin so I can make more to snack on while handing out candy tomorrow night. That’s how good they are! And don’t miss my step-by-step photographic guide to crisp and delicious roasted pumpkin seeds. 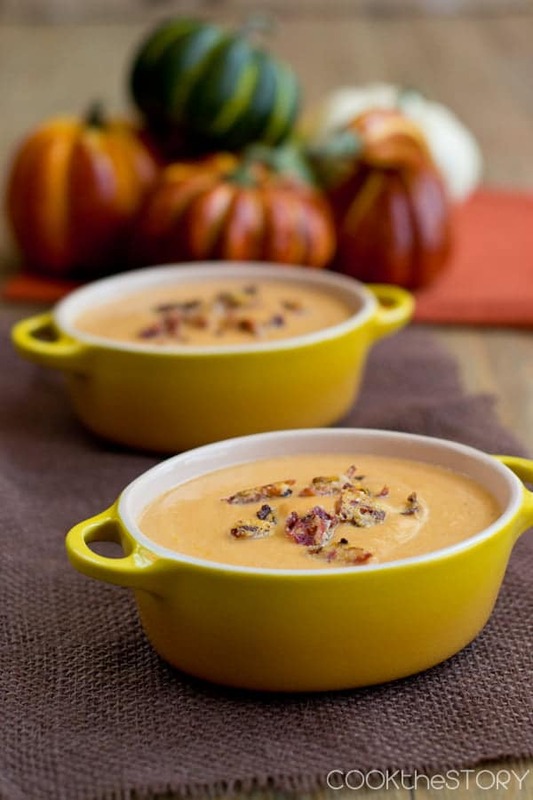 Oh, and take the flesh from your pumpkin (or a can of puree) and make up a batch of my 15-minute pumpkin soup for dinner. These instructions begin with a full large pumpkin. 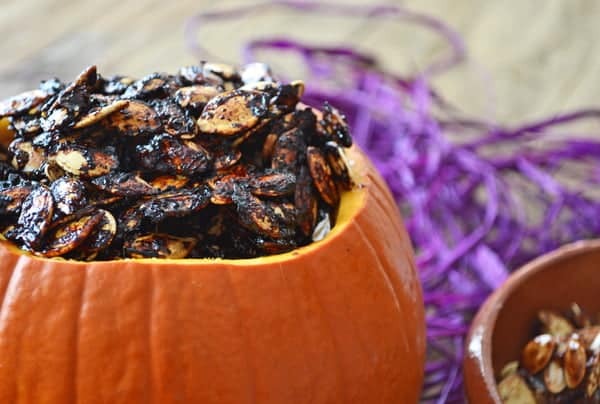 At the end, not only will you have delicious roasted pumpkin seeds but you will also have a pumpkin that is ready for carving. Dive into the pumpkin with one hand. Grasp a bundle of seeds in your fingers. Gently tug on them while squeezing your fingertips together at the point where the bundle of seeds meets the pumpkin fibers until the seeds release. Put the seeds into the colander detaching any bits of orange pumpkin fibers that have come along for the ride (don’t worry if you can’t get them all off. A lot more will come off in the rinsing step). Repeat until all the seeds have been removed from the pumpkin cavity. You should get 1 to 1 and ½ cups. Heat the oil in a heavy bottomed saucepan over medium heat. Add the pumpkin seeds. It is inevitable that some water has clung to the seeds so stand back a bit and beware of spattering. Stir the seeds to coat them all with the oil. Cook stirring occasionally until well-browned, about 4-5 minutes. Meanwhile, stir the remaining ingredients together in a medium-sized bowl. Remove the pan from the heat and immediately pour on the sriracha mixture. Stir quickly for a minute or two, allowing the liquid to evaporate and the sugars to cook and darken. Pour the seeds onto the parchment paper-covered pan and put the pan into the oven. Roast the seeds until they are sticky and crisp, 15-18 minutes. Cool the seeds on the pan. 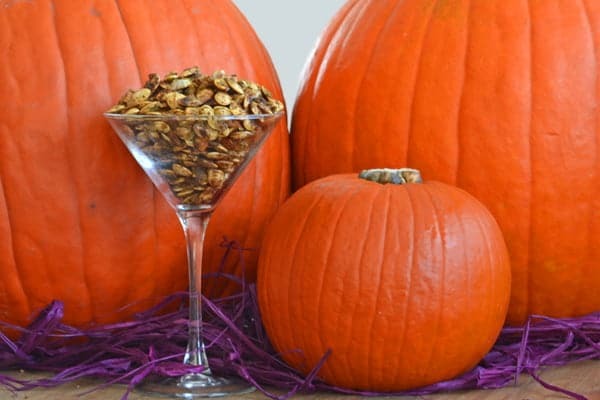 Transfer to a serving bowl or store roasted pumpkin seeds for up to 3 days in an airtight container. Because the sticky coating on these seeds can melt a bit, storing them in the fridge is a good bet. 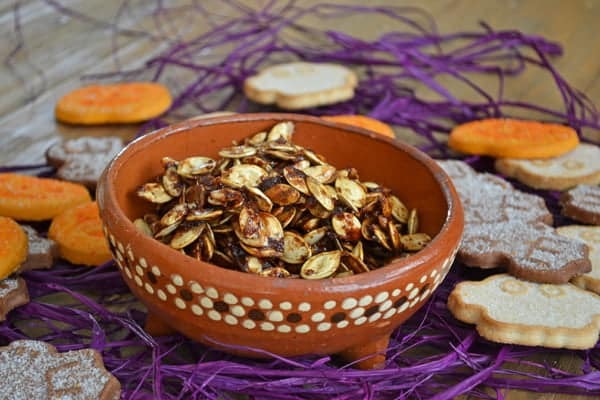 Are you wondering about other sweet and spicy pumpkin seed recipes? 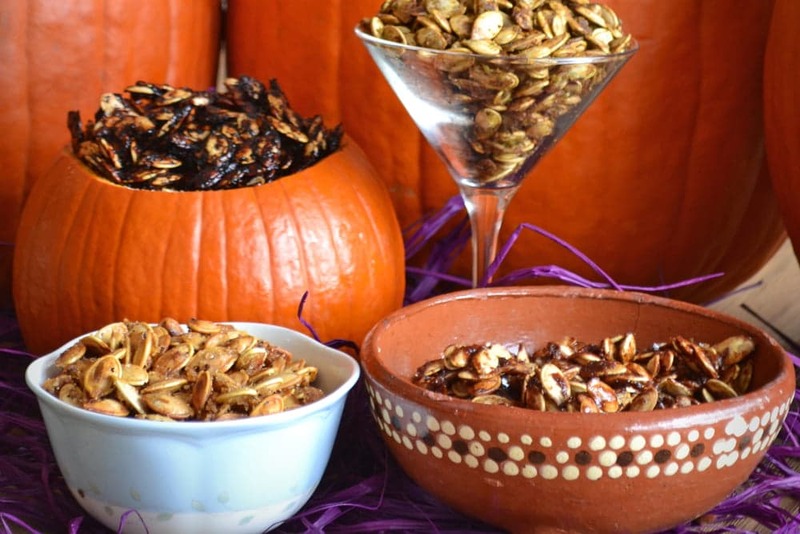 Here’s a recipe and a different method for roasting pumpkin seeds from Creative Cubby. Do not bake these! They tasted great right before I baked them.. now they taste as burnt as they look. They needed extra sriracha and the soy wasn’t necessary. Hi Jaclyn, I’m so sorry these didn’t work out. I tested them a few times last year when I originally made them. I found that the toppings didn’t adhere and the seeds were slippery without baking. I will do another test when I get back to Florida and adjust the recipe if needed. I appreciate your feedback. Those pumpkin seeds look amazing.